Felicity has, over a number of years, attracted a loyal and devoted following for her music. Not many would call it 'easy listening'. despite the warmth of her voice and the simplicity of the arrangements, but somehow listening to Felicity and her songs is like coming home after a long time away - everything seems to be the same, yet somehow, imperceptably, it's all different. The only question is what has changed - them or you? Her songs remind us that in older times music was used for more than just pleasure, as storytellers crossed the land, bringing news of changes far beyond our current horizons. 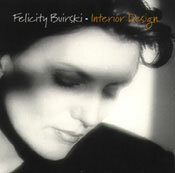 'Interior Design' was the second (Repairs and Alterations being the first) of an intended quartet of albums Felicity has already written. Felicity still gigs occasionally, and now has her own web site where you can learn about progress on the next album of the quaternity 'Committed to the Fire'.